Brazil were crowned the 2011 FIFA Under 20 World Cup winners on Saturday night after beating Portugal 3-2 in a thriller in the Colombian capital, Bogota. Brazil took an early lead with a goal by midfielder Oscar. But Portugal levelled just five minutes later, Alex scoring for Portugal. And so the score remained going into half time. On 59 minutes Portugal went ahead when striker Nelson Oliviera's shot somehow squirmed under the body of Brazil keeper Gabriel from a tight angle. It wasn't to be the only goalkeeping error of the night however. On 77 minutes Portugal keeper Mika completely misjudged the flight of Oscar fierce shot from an angle as it flew past him into the net. The 90 minutes expired with score at 2-2 and the game went into extra-time. Extra-time saw plenty of chances for both side, but it was Brazil who finally struck on 110 minutes. And it was that man Oscar yet again to secure his hat-trick and send Brazil into a 3-2 lead which was enough to clinch his country the Under 20 World Cup. In the third place playoff match Mexico beat France 3-1. Portugal defeated France 2-0 on Wednesday evening at the Atanasio Giradot stadium in Medellin. Later on Wednesday night Brazil overcame Mexico 2-0 in an entertaining game in Pereira. Portugal, Mexico, France and Brazil progressed into the semi-finals of the Under 20 World Cup. In the game of the round Brazil and Spain went to penalties after a 2-2 thriller. Brazil had twice taken the lead, but Spain hit back quickly on both occasions. Spain had dominated possession early on, but the effect of their 120-minute game against South Korea in the last round caught up with them and as the game wore on they began to tire. The Spanish missed two spot kicks and Brazil scored all four of theirs to seal a semi-final tie against Mexico on Wednesday at 8pm. France will face Portugal in an all-European tie, to be played on Wednesday at 5pm. Hosts Colombia were eliminated from the Under 20 World Cup on Saturday night after losing 3-1 to an impressive Mexican side. Colombia went behind in the first half on 37 mins with a goal from Mexican Erick Torres. 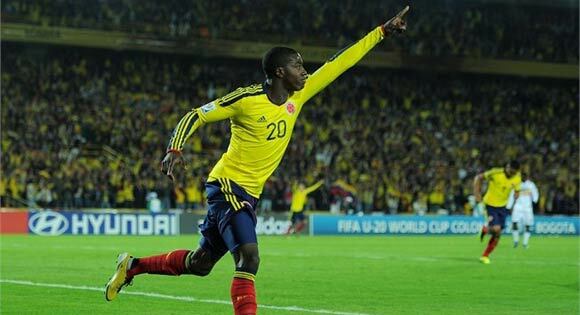 Colombia hits back on the hour mark through Estevan Zapata. However, two goals from Edson Rivera put the tie beyond doubt as Mexico progress to the semi-finals. Earlier on Saturday evening Portugal overcame Argentina on penalties in Estadio Jaime Moron in Cartagena. Portugal missed two of their first three penalties and it looked as if Argentina would progress. 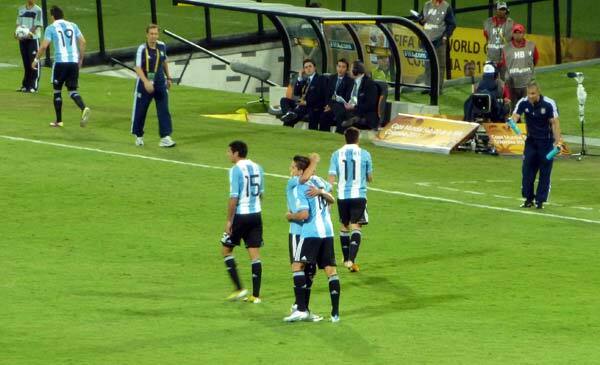 But the Argentines then missed the following two kicks sending it into sudden death. Argentina missed their 7th spot kick sending Portugal into a state of ecstasy. Spain were stretched to the limit as they scraped past South Korea into the quarter finals. Having been held 0-0 during normal time the Spaniards finally overcame South Korea 7-6 on penalties. France, Brazil, Nigeria, Argentina, Colombia, Portugal and Mexico also qualify for the quarter finals which begin on Saturday 13 August with Portugal vs Argentina. All group matches have now been completed with 16 teams qualifying for the knockout phase due to start on Tuesday 9 August. Three teams; Colombia, Nigeria and Spain all finished on a maximum 9 points. Spain, Nigeria and Saudi Arabia along with hosts Colombia are the only teams with 100% records going into the final round of group games which begin on Thursday evening. Colombia put in another fine display in front of a capacity crowd on Tuesday night beating Mali 2-0 with goals from Jose Valencia and Porto's James Rodriguez. Spain were comfortable winners over Ecuador, while Nigeria continued their impressive start to their Under 20 World Cup campaign with a 5-2 win over Croatia. Saudi Arabia thrashed Guatemala 6-0 and have yet to concede a goal in the tournament. Group F will be decided tomorrow with matches between England and Mexico in Cartagena and Argentina and North Korea in Medellin. Six teams recorded victories in the first round of games in the group stage at the Colombia Under 20 World Cup. Nigeria, Spain and hosts Colombia all secured emphatic wins in their opening games. The opening match of the 2011 FIFA Under 20 World Cup between England and North Korea kicked off in Medellin in front of around 5,000 spectators. Despite the excitement from the terraces of the impressively refurbished Atanasio Giradot stadium the game failed to live up to its billing. England dominated possession, but could muster only sporadic chances which were either spurned or well saved by the North Korean keeper. In the second half North Korea seemed even more content to sit back, content to hit on the counter attack and England became increasingly frustrated. As the stadium began to fill in anticipation of the Argentina Mexico game to follow boos started to echo around the open air stadium with every stray England pass. The match inevitably ended 0-0. The Korean players lapped up some applause as the England players trudged off. 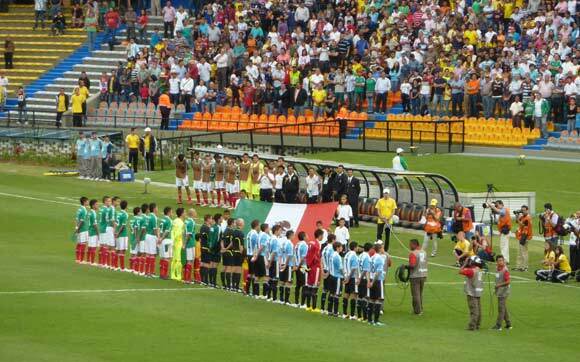 After an hour break the Argentina vs Mexico game kicked off and the difference in tempo was instantly noticeable. Spurred on by decent followings from both sides there were chances aplenty. Despite the numerous shots on goal the game reached half time with the two sides deadlocked at 0-0. In the second half Argentina started to exert pressure in the Mexican half which finally paid off after 70 minutes when River Plate star Erik Lamela struck home a curling left-footed shot from the edge of the area. And 1-0 it ended putting Argentina top of Group F.
Elsewhere Colombia overcame an early setback by France to win 4-1 in Bogota. Spain were convincing winners over Costa Rica. And Nigeria thrashed Guatemala 5-0 in Armenia to go top of Group D.